MK Bonnamy hit an RBI single in the top of the 8th inning that proved to be the game winner in the 3-2 win over Washington at the Puerto Vallarta College Challenge. Photo: Notre Dame Softball. Two teams in the Extra Inning Softball Preseason Top 25 faced off Saturday in the Puerto Vallarta College Challenge and it ended in bizarre fashion as #24-ranked Notre Dame beat #3-ranked Washington 3-2 in an eight-inning wild finish. After the Irish pulled ahead in the top of the 8th inning, the Huskies looked to have tied the contest in the bottom of the inning on a one-out RBI double by Kaija Gibson to plate pinch-runner Francesa Torraca. However, Gibson was thrown out attempting to take third on the play and the umpires then ruled that Torraca had entered incorrectly and was also out, ending the game on an incorrect substitution. Washington jumped out to a 2-0 lead in the bottom of the 1st inning on an RBI triple by Sami Reynolds scoring Sis Bates who had walked. Irish starter Payton Tidd would then throw a wild pitch to put the Huskies ahead by two until Notre Dame tied the game in the top of the 6th behind an Ali Wester RBI single and a Melissa Rochford RBI fielder’s choice. 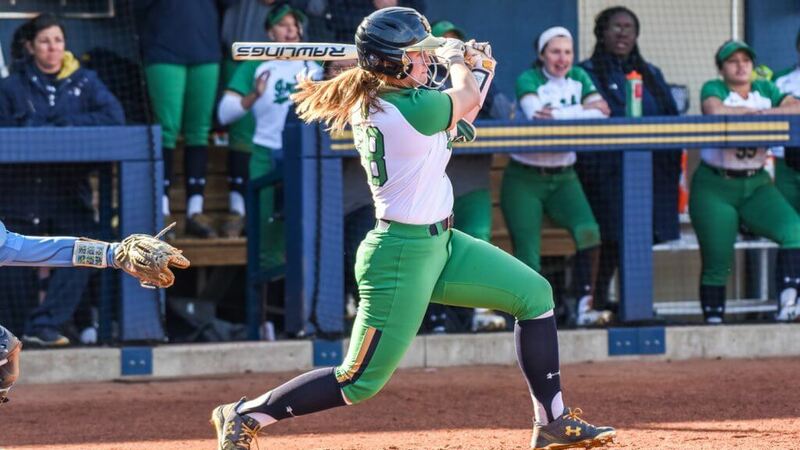 The Irish took its first lead of the game when MK Bonamy hit an RBI single to right in the top of the 8th giving Notre Dame its first win over a national top-three ranked team in its history and the 87th against a ranked opponent. Alexis Holloway (1-1) got the win for Notre Dame, pitching four innings and giving up just one hit and two walks. Taran Alvalo took the loss for Washington, its first regular season non-conference loss since 2017, despite giving up just two hits and no earned runs. She did hit one key milestone, recording her 600th career strikeout, making her just the sixth Husky pitcher to reach that level along with Danielle Lawrie, Jennifer Spediacci, Ashley Boek, Caitlin Noble, and Tia Bollinger. Washington will conclude its run at the Puerta Vallarta College Challenge on Sunday with a doubleheader against Liberty at 2 pm CST and then against Baylor at 5 pm CST. Notre Dame will compete next in the St. Pete Clearwater Elite Invitational, to be shown on the ESPN networks this week starting Valentine’s Day in Clearwater, Florida. The event will run from February 14 through February 17.